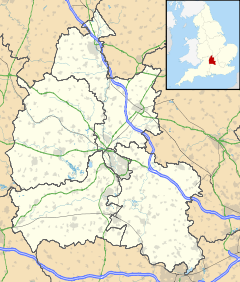 Blackbird Leys is a civil parish and ward in Oxford, England. According to the 2011 census, the population of the ward (whose boundaries may change occasionally so as to ensure minimal malapportionment) stood at 6,077. Unlike most parts of the City of Oxford, the area has a civil parish. The civil parish was created in 1990. In 2011 the population was recorded as 13,100. There was a Bronze Age or Iron Age settlement on the site. Evidence has been found suggesting pits and roundhouses, with remains of pottery and a cylindrical loom weight of a kind previously known only from East Anglia. The area was originally called Blackford Leys; blackford after the dark-coloured ford which crossed the southern branch of Northfield Brook at the entrance to Blackbird Leys farm. The ford would be located where Windale Avenue crosses Northfield Brook. [a] The farm was also called Blackford Leys farm. The Middle English leys meaning pasture or meadow. The Blackbird Leys Estate was built mainly in the 1950s and 1960s to meet the then pressing need for accommodation. It was part of a plan to re-house people from the dilapidated inner city. This included large-scale clearance of a site near to where the Oxford Ice Rink was built (The Oxpens). Many of the families that moved onto the estate originally came from this area. It was also a convenient site for factory workers at Morris Motors Limited plant in nearby Cowley. Greater Leys is sometimes applied to describe recent development adjacent and comprises mostly privately owned houses. The area has traditionally been staunchly Labour. The Independent Working Class Association performed strongly in the mid-2000s, holding three of the four council seats on Oxford City Council between 2006 and 2008. The local MP from 1987 to 2017 Andrew Smith lives on the estate. His late wife Valerie Smith was also one of the City councillors and County Councillors for the area and a former Lord Mayor of Oxford. Around this time, Blackbird Leys suffered from joy riding. Young men from the estate would steal cars and 'display' them (with a variety of high-speed stunts) to an audience gathered outside the estate shops (known locally as the 'top shops'). Politician Andrew Smith stated in 1991 that the extensive national media coverage of confrontations with the police in August and September left many of the wider public with a distorted picture of the problem. Some say journalists visiting helped encourage some of the action for filming. Crime levels have decreased consistently since 2004, a change thought to be due to a higher police presence on the estate though both recorded crime and rates found in the British Crime Survey have fallen across England and Wales. The Kassam Stadium is the home of Oxford United Football Club and is just within the greater boundary of Blackbird Leys in an area known as Minchery Farm. Initial construction begun in 1996 and the first football match took place on 4 August 2001. In 2006, residents from the estate took part in The Singing Estate, a Channel Five reality TV show following their progress from amateur singers to classical choir. The Blackbird Leys Choir emerged from the original choir and continues today. Schools on the estate include Pegasus First School, Windale Community Primary School and Northfield School. City of Oxford College has a campus situated on Cuddesdon Way which provides Further education, higher education, modern apprenticeships and community evening classes. Blackbird Leys has no mainline railway station but is served by Oxford Bus Company and Stagecoach in Oxfordshire which provides bus services between Blackbird Leys, central Oxford and Oxford railway station. The freight-only railway between Kennington Junction and the BMW Mini factory via Iffley and Littlemore forms the northwestern boundary of Blackbird Leys. It is part of the former Wycombe Railway that British Railways closed to passenger traffic in 1963. Blackbird Leys has two places of worship, The Church of the Holy Family which was dedicated on 10 April 1965 and Sacred Heart Catholic Church. Littlemore Brook, which flows from Blackbird Leys and through the Oxford Science Park to the south. ^ Back in the early 1950's a gravel lane led from Sandy Lane to Blackbird Leys farm. This lane was lined, either side, with horse-chestnut trees and was known to all local children as "Conker Alley". ^ a b "The Leys profile—2011 Census" (PDF). Oxford City Council. 2011. Archived from the original (PDF) on 5 August 2014. Retrieved 3 June 2015. ^ "Blackbird Leys ward profile—2011" (PDF). Oxford City Council. 2011. Archived from the original (PDF) on 24 September 2015. Retrieved 3 June 2015. ^ "Earliest Oxford". British Archaeology. September 1995. Retrieved 3 June 2015. ^ Oxford, cartogr. notes by J. B. Harley. Sheet 70 (1970). One-inch Ordnance Survey of England and Wales ([Repr.] ed.). Newton Abbot: David & Charles. ISBN 0715346067. ^ a b Newbigging, Carole (24 September 2014). "construction of Blackbird Leys The Development of Blackbird Leys". BBC Memoryshare. BBC Oxford. Retrieved 22 September 2016. ^ Ayto, John; Crofton, Ian (2005). "Blackbird Leys". Brewer's Britain and Ireland. London: Chambers Harrap. ISBN 978-0-304-35385-9. ^ Baldwin, Tom (30 May 2002). "Mr Smith celebrates with a takeaway". The Times. London. p. 1. ^ a b "Dreaming Spires and Screaming Tyres". Socialist Party of Great Britain. Retrieved 17 November 2015. ^ "House of Commons Daily Debates 9 December 1991 5.38 pm". Hansard. Retrieved 6 April 2007. ^ Wilkinson, Matt (13 March 2007). "Leys choir set to star again". Oxford Mail. Oxford. Retrieved 3 June 2015.